Amigos ClubReceive updates on special events, new menu items, menu reviews, and more! A collection of one hundred tequilas chosen for their exceptional quality, taste and significance. All of our 100 tequilas are 100% blue agave, each pour is 1½ ounces. 100% agave tequilas at their most pure and simple state. Spanish for “rested,” all of our reposados are 100% agave. Rested for 2-12 months in oak barrels. Anejo tequilas are aged in oak barrels for a minimum of one year, developing a more complex and robust flavor. Myers's Platinum Rum, Banana, Pineapple Juice, Coconut, Whipped Cream, Cinnamon, Frozen. Milagro Blanco, Jarritos Grapefruit Soda, Lime and Salt Rim. 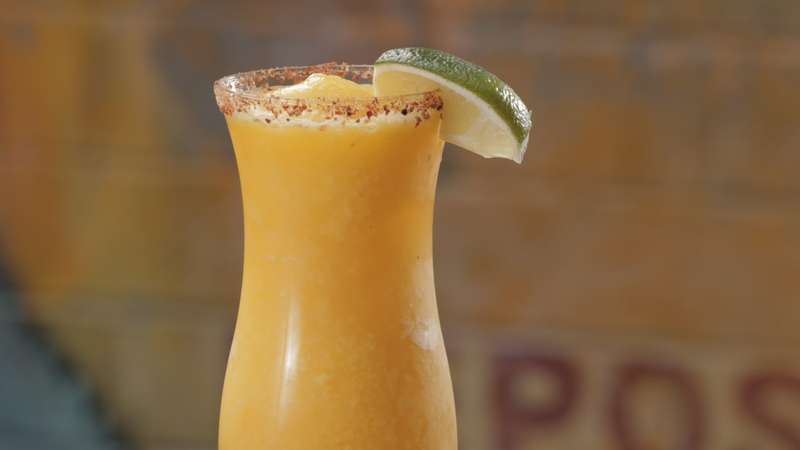 All of our Margaritas are made with 100% de Agave Tequilas and fresh squeezed lime juice. The best house margarita in town! Made with Sauza 100% blue agave Silver Tequila. Frozen or on the Rocks! Ancho Reyes Verde, Maestro Dobel Humito, Lime, Simple Syrup. Sauza Silver Cien-A-Rita, Mango, Frozen with Chile-Lime Salt Rimmer. Sauza Silver Cien-A-Rita, Coconut, Toasted Coconut Rim.